A jacket looks so much cooler when one doesn't put one's arms through the sleeves. I don't know how those Parisian editors do it, running around from show to show with their jackets thrown nonchalantly over their shoulders. When I do it and take a sprint to catch my tram it just makes me look like an awkward version of batman trying to prevent his cape from flying away. Givenchy, Neil Barrett and Philip Lim had some pretty amazingly constructed jackets where your arms peeked out and gave the illusion of having your jacket thrown over the shoulder. But the one who deserves most credit for making the nonchalant actually nonchalant and practical is Alexander Wang who already did a jacket like this a couple of years ago. Undo the seam on the bottom of the sleeve under your armpit. you have the best ideas! looks so cool! I love this! So simple yet so sublime. Great coat! And I love those Acne shoes. you always look like a million dollar! I Would Have Never Guessed It Was An Old Men's Jacket! Everything Is Cooler When You Just Have A Jacket Slouched Over Your Shoulders. Such an amazing DIY! Carven created a jacket with those sleeves about 2 years ago that I bought exactly for that reason and have loved it ever since. It definitely looks way cooler and lets you play with prints, colours and silhouettes in a completely new way. Such a beautiful DIY!! ANd I love your batman-cape illustration of the impracticability of the thrown on coat, it really made me laugh! (and I experience the same problem, although I might describe myself as a hunched and desperate batman trying not to loose half his outfit on the street). 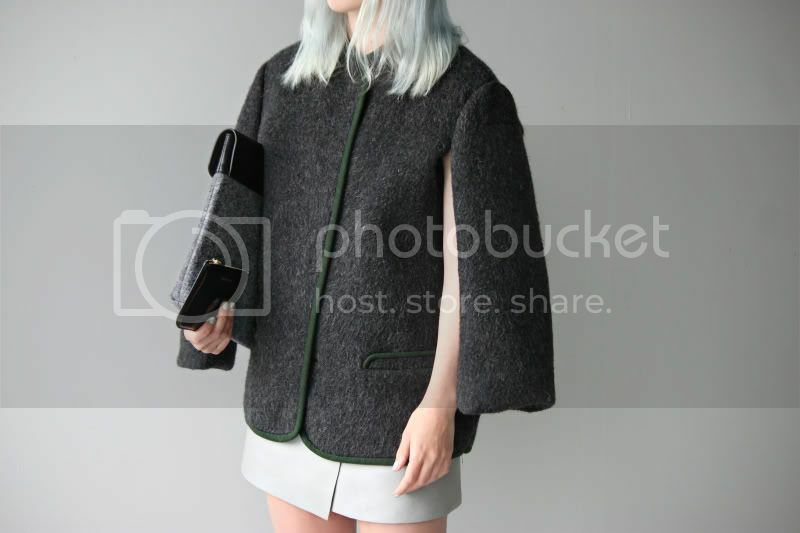 I'm really thinking of using this DIY on one of my old wool military coats and transform it into a cape-like coat :) Thank you so much for the idea!! I love your ideas and your aesthetic.You are doing an amazing job! it looks really great from behind and the side. but the front looks.. a little bit unlucky. echt een prachtige jas! En zo gemakkelijk te maken! Aaah die is zo mooi! Wat een goede vondst! this is a little bit hilarous and a lot cool - i love it! you are genius! wow, I love it so much! oooh i love these jackets! they look so simple and they are really nice. and i'm greatful because today i recieved your bracelet and necklace! i won one of these from nelly.com! i wasn't expect that so i was surprised when i get email about that day before yesterday! Amazing pants! I was about to order it! Love the way you matched it! This looks so much more complicated than you explained! Love how It fits. Such an extraordinary project, with chic results! Love how the piping on the jacket matches your shoes! As soon as I have time, I'll do it! genius!!! this jacket is already really cool, and the volume added after you altered it looks so amazing. Ah i love simple DIY's this will definately come in handy this autumn! Pretty impressed that you made this jacket , very nice style lovely items ! Great DIY and so simple! Love it! i'm in love with this look!!! I have a Bec&Bridge jacket with cut-outs on both sleeves - I've had it since early 2010. The 2nd look turns it into a short-sleeved jacket with surprise 'arms' flapping underneath - love it! I get to take this jacket across the seasons, and am super glad about that as it is by FAR my favourite. It's also cropped with gold "horse-harness" details back and side, and it is SUPER light, and oh so comfy. I'm looking forward to giving this DIY a go! Love your work and love your look! This jacket is amazing ! The texture looks great ! I love so much this openness that makes the garment becomes so impressive and almost poetic. I love how architectural your clothes are and how perfect your palette always is. Your hair looks sick by the way, especially with your skirt here. Heel heel heel erg mooi Ivania! Ik denk dat dit misschien wel mijn favoriete outfit post ooit van je is!! simpel maar heel effectief! prachtig. A great little project , love your style! LOVE it! I can't believe that this is a DIY from a thrifted item! FAB! BRILLIANT. Amazing as always, great job. I appreciate when I see well writen material. Your time isn't going to waste with your posts. Thanks so much and stick with it No doubt you will defintely reach your goals! have a great day! The jacket is so cool. Nice job! Any idea where I can get hold of those heels in black? This is my favorite trick. I actually have an old Acne jacket like this too, with a hole in the armpit. But can we talk about how awesome that thrifted coat is though??? The fabric plus the minimal structured shape plus the green piping? OMG what a good idea!!! This is fab! Such an easy but effective diy, i love it! Find more information about Acne Scar Treatment Delhi at Guide to Treating laser mole removal gurgaon by Dr.DM Mahajan.